In early 2008, Adham Amin Hassoun stood before a federal judge in Florida to learn his punishment for supporting Islamic extremists across the world. Hassoun, a computer programmer and married father of three, had been found guilty of conspiracy and terrorism charges a few months earlier and was facing a maximum of life in prison and a recommended sentence of up to 30 years. But the judge in the case rejected the argument that Hassoun was a danger to the public and a threat to national security, and instead gave him 15 years and 8 months in prison. Hassoun served his time. However, 17 months later, he is still in custody, this time at the Federal Detention Facility in Batavia. The government wants to deport Hassoun but there's a problem: No country, including his native Lebanon, will take him. "Adham Amin Hassoun is a stateless Palestinian man," his lawyers at the Community Justice Clinic, an arm of the University at Buffalo School of Law, said in court papers filed on his behalf. In a civil lawsuit filed Friday, Hassoun claims the government is seeking to permanently detain him, possibly for the rest of his life, because of a "unilateral" determination that he is a national security threat. He notes that he "lived peacefully" in the United States for more than a decade before his arrest and that his crimes did not involve acts of violence and were never directed at the U.S.
His lawyers also believe Hassoun's arrest in 2002 was part of a government-authorized roundup of Muslims across the country in the months after 9/11. "The government had been surveilling him for several years," said Nicole Hallett, director of the UB law clinic. "It was only after 9/11 and the widespread detention of Muslims that he was arrested." 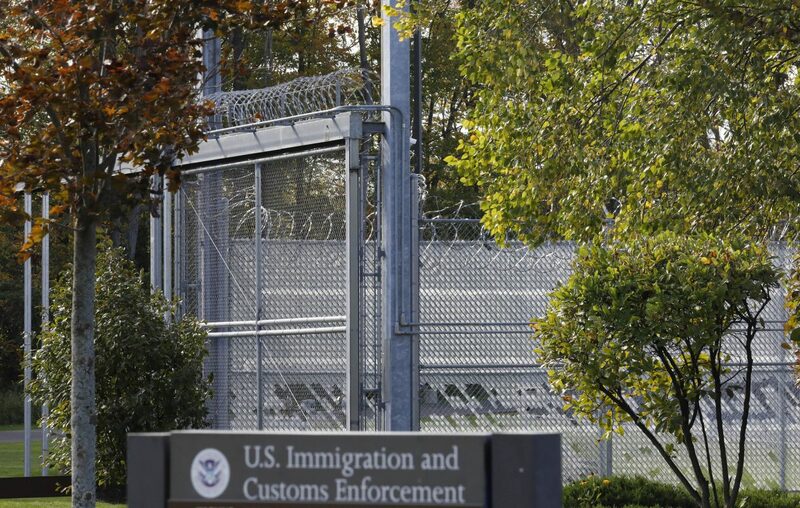 U.S. Immigration and Customs Enforcement is leading the effort to keep Hassoun in custody and, in court papers, claims he is still a national security threat. The agency also points to an FBI memo recommending his continued detention and referring to three anonymous reports from Batavia detainees who claim Hassoun tried to recruit them for illegal activities. "You remain a continuing threat of recruiting, planning and providing material support for terrorist activity," ICE said in a recent letter to Hassoun. Hassoun, according to Hallett, has been given no information about the allegations and noted that the government never charged him with a crime while at Batavia. "We don't think Mr. Hassoun is a security threat. We think the government is raising this issue in order to re-litigate the case they lost in district court," she said, referring to the government's unsuccessful effort to have Hassoun sentenced to much more time in prison. First arrested in 2002, less than a year after 9/11, Hassoun was eventually accused of joining a support cell in south Florida designed to send money and recruits to jihad conflicts overseas. Prosecutors said he also recruited Jose Padilla, a Chicago street gang member who converted to Islam and was later accused of plotting a radioactive "dirty bomb" attack in the U.S. Hassoun and Padilla reportedly met at a mosque in Florida's Broward County. At the time of Padilla's arrest, then-U.S. Attorney General John Ashcroft pointed to the allegations of a dirty bomb attack and said Padilla was part of an "unfolding terrorist plot to attack the United States." During the trial, the government introduced evidence showing Padilla traveled overseas and sought to attend an al-Qaida training camp in 2000, but never pursued the allegation that he was planning a dirty bomb attack. Defense lawyers countered by introducing evidence of Padilla's more than three-year-long detention without charges and the prolonged isolation and harsh interrogation tactics he endured. Hassoun also challenged the government's case and suggested his support for extremists was limited to advocacy and money. In the end, both men were convicted of conspiracy to murder, kidnap and maim individuals in a foreign country and conspiracy to provide material support to terrorists. At his sentencing, Hassoun said it was never his intention to hurt people. "We didn't want to kill anybody," he said at the time. "I spent my life helping people. And I will never end it hurting people." Now 56, Hassoun was born and raised in Lebanon. His Palestinian parents, refugees after the 1948 Arab-Israeli war, resettled there and raised a family. In court papers, Hassoun refers to the Lebanese civil war that lasted more than a decade and how he was captured by Shiite fighters, held for four days and tortured. He came to the U.S. in 1989 as a non-immigrant visitor and over the next decade married and had three sons, all U.S. citizens. The family moved back to Lebanon after he went to prison. At some point before his arrest, Hassoun sought a green card and while awaiting approval was detained on an immigration charge. He was later accused of taking part in the support cell, the allegation that led to his jury trial and convictions. After serving his sentence, Hassoun was placed in ICE custody and, for the next year, the agency tried unsuccessfully to deport him. Hallett said the West Bank would be willing to take him back, but Jordan and Israel oppose the move. She also noted that one of Hassoun's co-defendants, Kifah Wael Jayyousi, a U.S citizen, was convicted of the same crimes, given a similar prison sentence and yet he's now free. "Essentially what you have is a dual system for citizens and non-citizens," she said. "We think that's unconstitutional. We think it also means that if they can detain Mr. Hassoun, they can detain anyone." An ICE spokesman said the agency could not comment on Hassoun's status or allegations because of his lawsuit against the agency.